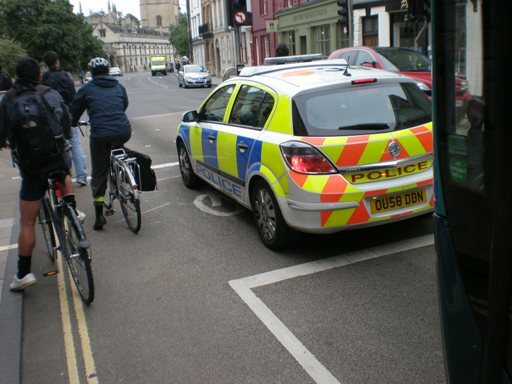 Cycling in Oxford is a fairly short-distance activity. Most workplaces are within a couple of miles of home. Secondary schools a mile or so, the shops somewhere in-between. These distances are slightly-annoying to walk, but easy to cycle. There’s no need for special cycling gear, and the chance of getting caught out in the rain is fairly low. Some people will happily cycle further, but it becomes a different activity when you go more than a couple of miles, and rather fewer people are prepared to do it. You get much the same pattern in the Netherlands – for journeys more than a couple of miles, the modal share for cycling drops off, and people drive instead. So if you want a high modal share for cycling, it’s really important to have origins and destinations fairly close together, in a “compact” city. The optimal situation is to have shops and offices concentrated in the city centre, with inconvenient car-parking. Is Oxford particularly unusual? We can look at the average bike-commuting distance in the census, to make some comparisons. While commuting only accounts for about a quarter of journeys, it gives some idea about the character of cycling in each area. 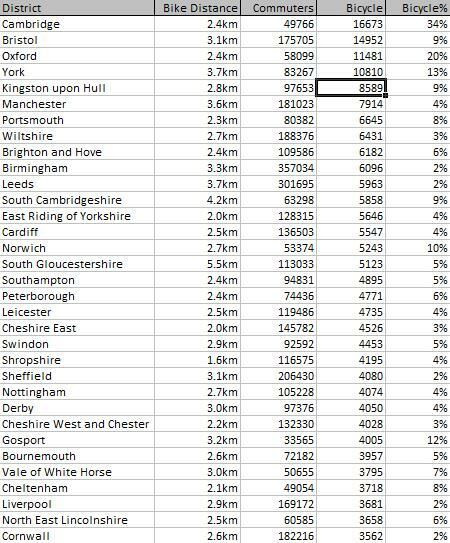 These figures are for England and Wales, excluding London, ordered by the number of cycle commuters in each area. Oxford and Cambridge are quite similar, with average distances about 2.4km (about 1.5 miles). The two highest figures are for authorities which cover the outer suburbs of Bristol and Cambridge, respectively. The other high figures are for larger cities (and York). The value for Oxford seems to be near the bottom of the range, but not at all untypical. The overall conclusion is that – outside the major cities – short distances are the norm. London presents an interesting contrast. Some of these average distances are very high, and it would be fair to say that cycle commuting has a rather different character in London. But if you look at the outer boroughs, where the numbers of cyclists are lower, there seem to be two different effects. 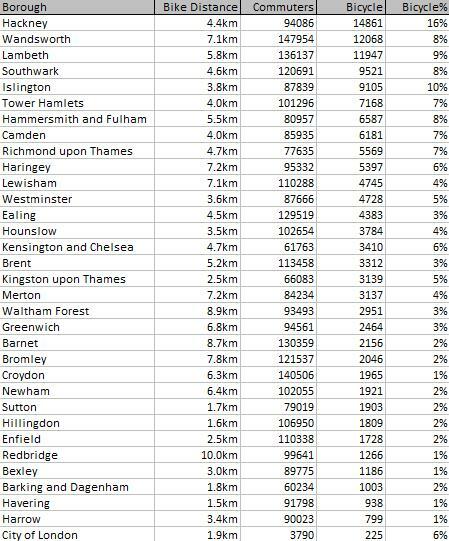 For some boroughs the average distance is very high: these are boroughs where the dominant destination is central London. In contrast, some are very low: these are places where cycling to central London hasn’t become fashionable, and you just have some very local commutes. Slightly more encouraging is somewhere like Kingston, which has a reasonable volume of cyclists and a fairly “normal” average commuting distance. My impression is that cycling in London has become too dominated by unusually-long commutes. Such commutes aren’t representative of the mass of short journeys that are characteristic of a high-modal-split situation. London needs to refocus on a dispersed pattern of short-distance trips closer to home, if its revolution is to succeed. This will require a much more dispersed pattern of interventions, rather than focusing on a handful of routes. In effect, pretty much every road needs to be cycle-friendly. Shakespeare wrote of the seven ages of man: the mewling infant, the whining school-boy, the sighing lover, the quarrelsome soldier, the wise justice, the slipper’d pantaloon and ending with an oblivious second childhood. To me, Shakespeare’s point is that people change over time, that we have different attitudes, and that none of those attitudes is inherently better or worse: they are just different. Our society is inevitably made up of people of different ages and attitudes, and we need to work with that variety. In a similar vein, I’ve been observing how cyclists change, particularly through their childhood, but also in parallel through parenthood. 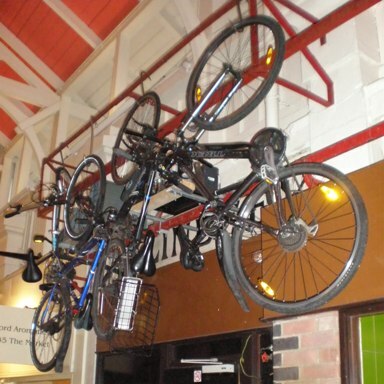 If you want to build a cycling culture, cycling has to be adaptable to many life changes. For the first few years, children are mostly passenger cyclists. 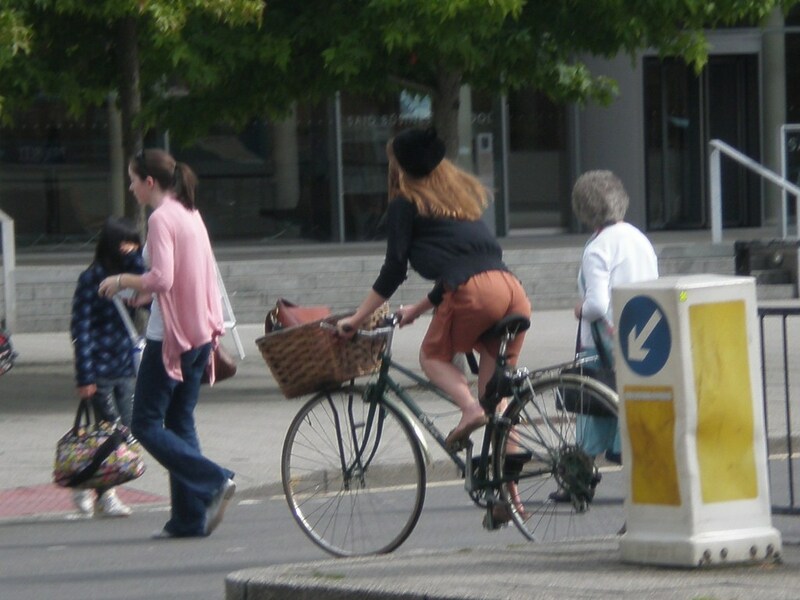 While there are a variety of specialist bikes and trailers, most people manage with a simple bike seat. You can only use these from about nine months, but that typically coincides with the end of maternity leave. The child’s trips mostly consist of going to nursery, and to the playground, maybe to the shops. Generally these are quite short. From about three, children get their own wheels, starting off with a scooter or perhaps a balance bike. Later they progress to a conventional bike, mostly with stabilisers. At some point around age five they learn to pedal. These get used for very short trips, mostly leisure trips, for instance to the playground. When the children start school, they sometimes cycle, although there’s often little speed advantage over walking. For the moment, almost all cycling is on pavements, or paths, very slow, and only for short distances. For longer distances, parents might have a trailer bike (or similar), but for many families, children in this age group only cycle for short trips. For slightly longer trips they’ll walk along the main road, or get the bus, or go in the car. As children get a bit steadier (age seven or so), they can start cycling on quiet roads, heavily supervised. If there are reasonable quiet routes, cycling can be used – particularly in summer – for longer leisure and shopping trips. Bikes are still unlikely to be used to get to school (unless you live further away). As children get older, and parents get more confident, the children can manage longer trips, on slightly less-quiet routes, with less supervision. 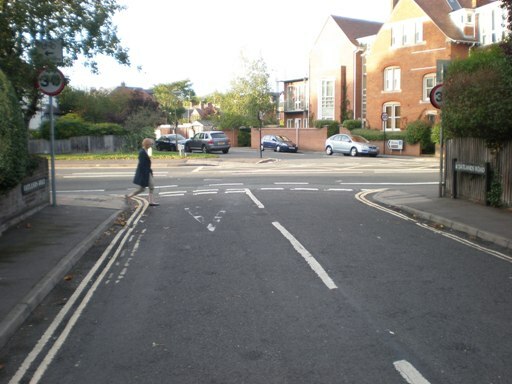 The parents will teach the basic rules of the road – keep left and give way at junctions. Children are still likely to be accompanied at all times. From about nine, parents will sometimes decide to take their children on shorter, busier routes – because they can. To start with, these will be strictly left-on, left-off, with the parent close behind giving instructions. A certain amount of dodging onto the pavement may be required, perhaps to use a crossing. At eleven, it’s crunch time. There’s cycle training on offer at the school, and the secondary school is a mile in the wrong direction. If there’s a viable quiet route to secondary school, now is the time for the child to learn enough road skills so they can get there under their own steam. Making this possible is a key objective. 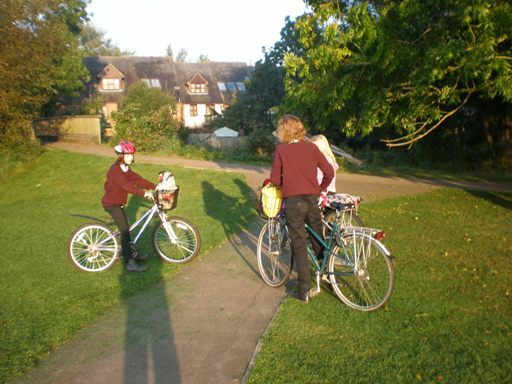 Take-up of cycling by Year Sevens can be better than 50% if the conditions are amenable. It will never get close to that level if they start later – and in particular, subsequent take-up by girls will be virtually zero. If a secondary school child has a bike in reasonable condition, and uses it to go to school, they will start using it for other independent trips. They will start off using the quiet routes, but progressively take busier short-cuts, with parental approval and negotiation (and sometimes without). The wise parent gradually lets off the reins, with useful tips and crossed fingers. This is an education process for the parents, as much as the child. Some time about age thirteen, if conditions permit, and parents allow, the child will effectively have the freedom of the city. What is it that makes that possible? Firstly quiet routes that let you get about the city. 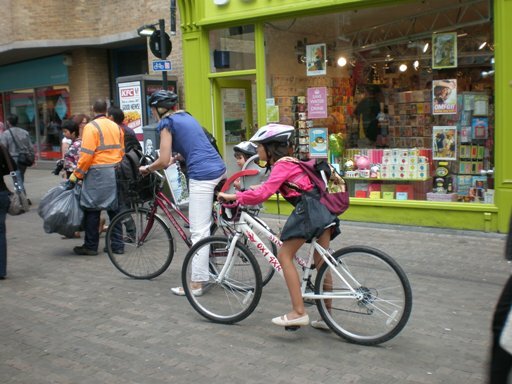 This allows cycling to be a viable mode for families and for the first stages of independent cycling, and allows the bike to be used for transport, rather than just for play. These quiet routes don’t have to be direct, and don’t all have to be perfect, but the better they are, the more they will be used. 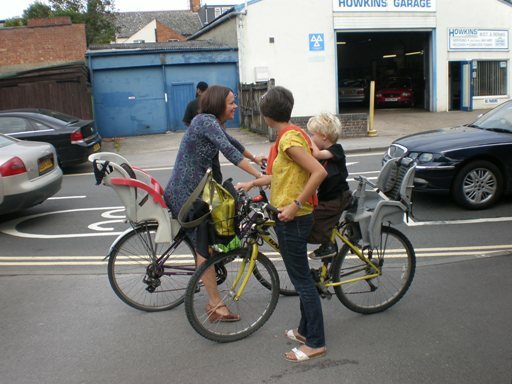 The less-perfect routes will prevent some family cycling until the child is older. For short distances pavements are adequate to start with, but for practical distances, proper quiet routes are required. Secondly, there have to be direct routes that adults and teenagers can use to get about quickly – preferably quicker than any other mode. Direct quiet routes are best of all, of course, but they are rarely possible. The direct routes mustn’t be too hairy – otherwise they won’t be used by all the adults in the family, and the teenager probably won’t be allowed to use them. They need to be tame enough that any adult with basic cycling skills can use them without worrying about it too much (or too often). Whether teenagers continue cycling is another matter. There may be differences of opinion over whether a helmet should be worn. Girls in particular value travel modes where they can chat with their friends. If one among a group stops cycling, the others will probably stop as well. If the cycling culture is very well-established, and there are wide tracks or quiet roads (and no steep hills), they probably will keep cycling. But more often, they’ll switch to walking or getting the bus. 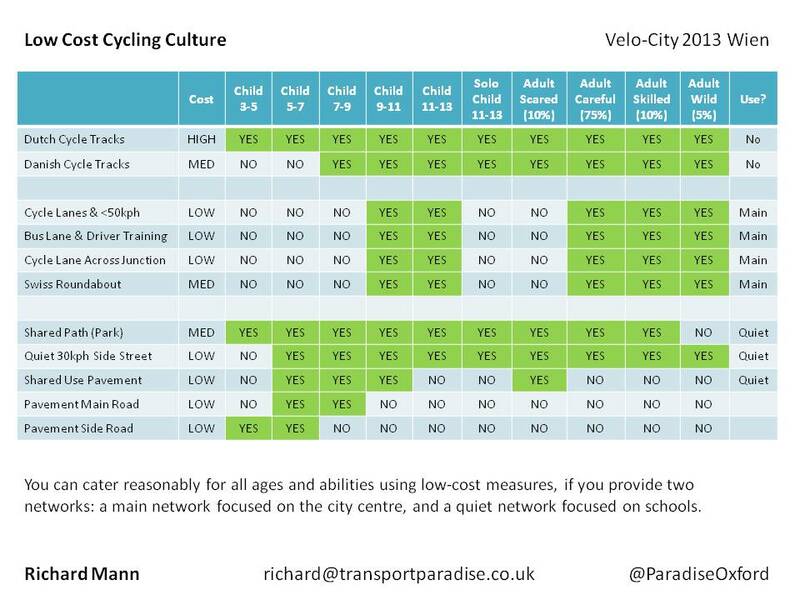 When they’re older, if they’re living somewhere where cycling is viable, they’re likely to return to cycling … probably just in time to have children. And so the cycle continues. You walk the bike to school, with the youngest cadging a ride. You stop for a chat. Then you take the youngest to nursery, and head for your desk. School gate to desk in next to no time.